This week, I've been exploring the 'Chinese problem' when it comes to Christmas. How can we joyfully prepare and decorate for the holiday with products made by exploited workers in crowded dormitories far from home, workers who are forced into following the one-child policy, sterilizations and abortions? 1. Re-use old lights (most likely made in China). There is no sense in filling landfills with working lights. Preserve old lights for the next year by untangling, rolling and putting in a spot where they won't get crushed. My lights that I use are 7 years old. My point with these posts is to discourage readers from buying more Chinese lights. 2. Make a Jesse Tree. This is a great memory from my childhood. A Jesse Tree is a tree (or branch or other way to display the ornaments) with ornaments that the family makes that covers salvation history. We used paper Jesse Tree ornaments that my parents bought years ago. I learned a lot of scripture, and it is a beautiful reminder of the meaning of the holiday. 3. Store all Christmas items together. Yes, I have been doing this for about four years. Before that, Christmas decorations, books and music were scattered. Not rocket science, but it helps creativity if holiday items are easy to get to. Things will be less likely to break, so you can re-use instead of buy like items. I have a friend who has a lot of Christmas books in a big, special tub; she brings it out only for the holidays. The books themselves are decorative because they are different than what is usually around. 4. Use natural items to decorate. Ideas abound at marthastewart.com and even notmartha.org- if you live in the North, decorating with evergreens is easy and traditional. Live in the South? Use the vegetation native to you. Californians can use ecalyptus! Ecologists state that one has to have an (most likely Chines made) artificial Christmas tree for over 8 years before it 'equals' the environmental impact of buying a farmed, natural tree. So, support Oregon's economy and make a natural tree part of your budget. 5. Embrace a Christmas-style minimilism. I would never presume that anyone would prefer an empty, minimilist house during the holidays. The decorations are part of the fun. BUT is it necessary to buy new decorations each year (yes, people do this)? The clutter-free aspect of this comes in when one buys things with intention, not just filling up the cart with the latest sale items. Beautiful, simple decorations would be a simple line of lights (hopefully saved from years past until I can convince Walmart to open an American factory) along the roofline and then a natural wreath on the front door. The over-the-top lighting display, which are fun and festive, actually are counter-productive to the true celebration of Advent and Christmas. Until December 25th, we are actually in a season of preparation/penitence, but that is for other post. 6. Get Crafty. If your natural tree is your center-piece, use old, memory-rich ornaments and let the kids contribute! In my opinion, the new (Chinese made, natch) foam kits just are not pleasing to the eye. Work during the year on easy crafts that lend themselves to be ornaments on a tree. An easy decorating idea is to have ornaments hanging from a cord along the windows- a good way to keep precious ornaments out of little hands. The blog Like Mother, Like Daughter is the perfect place to get inspiration- here's an example of their 'if I can do it, you can too' philosophy. 7. Make time for the important things. Baking, cooking, time with family and friends, playing Christmas music, special devotions- these are the things that are important and what your kids will remember. They won't remember fondly the times we moms struggled at the shopping malls for the perfect new gadget. They won't remember that we cut down on the new Christmas lights. They will remember that we celebrated the birth of our Lord. That is what is important; we can't lose sight of that. Since writing on Tuesday, I've been searching for a non-Chinese, fair-trade solution to buying lights made by prisoners and slave-immigrants and indentured servants. What have I learned? As far as I can surmise, Christmas lights are not made in the United States or Europe at the present time. China has a monopoly on their manufacture. Holiday lights were invented in the United States in the 1920's and were manufactured here by several companies including General Electric. Until the early 1960's, the US was the largest maker of Christmas lights in the world. Companies prospered making these lights in the U.S. until they lost most of their business to foreign competitors who were able to manufacture the light sets for less money. Because making these lights involves many processes that cannot be automated, companies located in countries where manual labor was cheap began to dominate the market. Lack of Reasonable Ecological Protections for Workers and the Environment- Christmas lights carry a warning label: "Handling the coated electrical wires of this product exposes you to lead, a chemical known to the state of California to cause cancer and birth defects or other reproductive harm". Lead also causes brain damage in children with no known safe exposure level. Prop 65 of California only addresses birth defects, so if lead only caused severe brain damage in children, but not birth defects or cancer, no warning would appear. Electrical cords contain lead within the PVC covering. Christmas lights from China (all of them) can contain quite a bit more lead since there's no effective regulation of lead in China; now that all lights come from China, there's no other option for US consumers. It might be unsafe for our children to handle these lights. It is unsafe for the workers who are exposed to lead up to twelve hours a day. The Lack of Consumer Choice- No matter what side of the political spectrum one might be on, it should give one pause that one country is becoming the sole manufacturer of our goods. We are left with little choice; it seems that the tidal wave is crashing down upon us and we will be forced to kowtow to China and yes, the multi-national corporations that benefit from monopolies. The One-Child Policy and Forced Abortions and Sterilizations- This policy has been in existence for over thirty years, so it is 'just the way it is' in China. Finding information on this policy will break your heart. The world has so many problems; it would be easier to look the other way and be in denial. China is not the only country with human rights violations; Europe and the U.S. have their own problems as well. It is just that China's one-child policy is so 'in your face' with its contempt for all human life. Even if one is a staunch pro-choice feminist- and perhaps because one is a feminist- the cries of these women cannot and should not be ignored. Personally, I cannot enjoy a tree covered in the results of the one-child policy. And yes, it is a very small gesture for these women, but I will continue to not buy Christmas lights until someone (hint, hint?) makes them in a country where human rights are not violated. My '7 Quick Takes' post tomorrow will suggest some ways to decorate for the holidays without buying new lights made in China. See you then! Jesus suffered the pain of thorns in His head, and did so silently. We pray for the mothers and fathers of aborted children. So many of them suffer deep grief and regret over a choice they can never reverse. So many suffer in silence, because others tell them it's nothing. After 5 weeks in the NICU and with no sibling allowed to touch her, she finally came home. We are blessed to live in a country where siblings are possible; this beautiful picture of brother and sister together is nearly impossible in China. If interested, please read my post from Tuesday. Imagine your beautiful evergreen decorated with ornaments collected over the years, the latest kid-made creations, twinkling lights, and a star or angel at the top. You sit on your comfy couch with a mug of cocoa in your hand, listening to Nat King Coles' Christmas album and watching the kids look at the gifts and try to guess what they contain. You wonder: Midnight Mass or morning Mass? Caroling with the Smiths or the Murphys? Do we have time to make tamales with the Rodrieguez family this year? Contrast this lovely image with the reality of working at a Christmas lights factory in China. Not only are you far from family and living in cramped and unsanitary dormitories, you don't know what this "Christmas" is; you would be in trouble with the party if you insisted on celebrating the religious aspects of this holiday off of which your country and corporations make so much money. Your fingers are cramped with the constant twisting to make the Christmas lights that Westerners seem to buy every year. You've heard that some people buy new ones simply because the old ones are tangled; it is easier to buy new ones on sale than to untangle, so countless strings of lights fill landfills. You don't want to think about the lead that you are exposed to every day; your family needs the money you send to their poor province. When I look at my Christmas tree, I remember everything that happened in past years. Every ornament has a memory attached to it. I have an ornament we bought on our honeymoon; I have old ornaments that I made myself. Listening to songs from the old country, we talk about times past while we decorate the tree and drink the required eggnog (regular store-bought cut in half with milk and with nutmeg on top). I want my Christmas memories to be built on love, not the discrimination of workers far away. Why am I focusing on Chinese-made Christmas lights? We have to start somewhere. Also, the manufacture of the Christmas lights is especially environmentally dangerous to the earth and the workers. I haven't purchased Christmas (or Easter) decorations or other holiday-themed items made in China for the past six years. My breaking point was a commemorative John Paul II ornament made in China sold at the local J.C.Penny. I just couldn't take it anymore. I know that the United States has basically sold itself to China for its cheap goods and labor. I know that wood and even fish from Oregon and Washington are sent to China to be processed and then sent back to the U.S. to be sold. I also know that many other countries (yes, even the U.S.) is discriminatory to its workers in the name of cheap goods (dollar store, anyone?). But the combination of China and Christmas feels especially ominous this year. China is now an economic superpower, thanks in part to the West's love of cheap goods that they supply. We tolerate their strict communism on social issues because the Chinese government seems to have become capitalists on the grandest scale. Many might be envious of Chinese-style full-scale capitalism that is without the fetters of environmental regulations and workers' rights. We ignore their one-child policy and everything that that entails. A woman can be forced into an eight-month abortion because she already has a seven-year old child. We look the other way and wait for the Christmas lights to go on sale at Walmart or Target or our favorite store that is so much hipper than Walmart and Target. What can we do? The problem is huge; the horse is out of the barn, and China will always supply all our Christmas 'needs'. That might be true, but we should start somewhere. I am challenging all my family and friends and blog readers to start by not buying Christmas lights made in China! In later posts, I'll give some alternative ideas to made in China Christmas lights. In the meantime- please contemplate my challenge. Please vote in the poll to your right- I'm curious what you think. Thanks for reading this far- God bless you! "Maria" was adopted internationally, her new parents knowing that she would need a heart surgery. Their only regret was that they couldn't speed up the paperwork so they could start their life with her sooner. She practices her violin along with the other children in the family. "Lili" is the well-loved middle child and functions almost at a level of her much younger sister. She participates in a homeschooling drama group and will be in the year-end Shakespeare play. 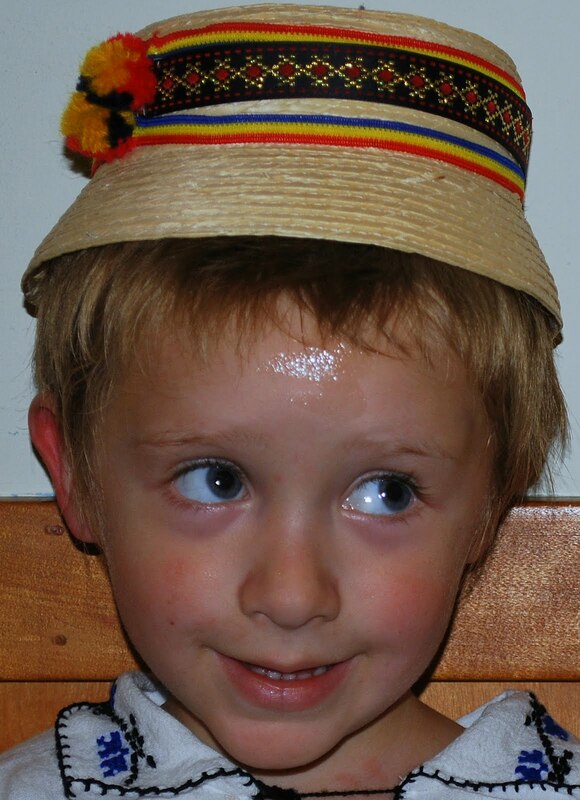 "John" was a DS surprise in a multi-lingual family; he uses sign language to communicate most of his needs. Through the loving care of his Catholic family and the prayers of the faith community, his physical challenges are healing. "Amy" is an only child with verbal skills that increase every day. She likes to have friends over to play and is a joy to her church family as well. Although any disability is a challenge and makes child-rearing more difficult, all four of these children show that Down Syndrome is a gift simply for the reason that they themselves are gifts to the world. They make their families stronger, more prayerful and more tolerate of the differences that exist in each person. Children with DS are gifts to God from God Himself because every child is a gift to God from God. And it follows, children are gifts to their family and the world from God. It is every parent's hope that their children will make the world a better place and contribute to society with their talents. A child with DS might change expectations, but then the parent starts to see the unlimited potential that their child has. The child might not be conventional, but he or she gives more to the world than he takes. The innocence, optimism and hard-working nature of the child inspire other people to emulate their character. Knowing these kids with DS reminds me a little of why the Eastern rites exist in the Catholic Church. (It always can connect to that for me :)....) Wouldn't it just be easier if we gave up our rite and went with the much larger Roman rite? Or perhaps we should just be Orthodox. As the state religion in their respective countries, they are so much bigger and powerful than we. No, we'll stay the way we are- small and unimportant, as a reminder to the world that the Church was one. In a similar way, it might be easier to not have a child with DS. There are parental expectations of worldly success that the child most likely will not meet and possible severe health complications. But the child with DS reminds the world that all human life is in the image and likeness of God. The child with DS tells us that he or she is as much in the image of God as the intellectual and the athlete. The child with DS shows all of us that making a family is not an outcome-based factory; it is a domestic church that welcomes all whom God invites. I have four physically and intellectually normal children. I cannot relate to the fear that DS parents might feel, knowing that their child will be so different. I cannot relate to the isolation that these parents feel; statistically, almost 90% of babies diagnosed with DS in the womb are aborted. There should be many more of these children with DS, but they are gone from this earth. DS is much more likely with a mother over the age of 40, and more over-40 women than ever are giving birth. We should be seeing a lot of kids with DS. Most of these children exist only in the bosom of Abraham and the mind of their parents, perhaps regretting what they have done. About this all-over-the-map, confused post: I wanted to write a post on Down's this Sunday after seeing one of our friends and being inspired by her and her family. Then, this past Monday a bit of a blow-up occurred in the Catholic blogosphere- Simcha Fisher wrote an eloquent response to an article Jason Negri wrote at Inside Catholic. Former U.S. President Bill Clinton was right when he stated this past week at a UCLA rally, "When we care about something in America that's really important to us, like football, we know the facts." Of course, he was speaking about politics skewed to his particular leanings. I'd like to explore the meaning of his quotation from a different standpoint. Is spirituality important to us? Is religion important to us? Is the Catholic faith important to us? Is God important to us? Do we know the facts? Are Moses and Jesus contemporaries, or do they come from different eras? Why are we constantly crossing ourselves in church? Why do we stand up for a blessing? What does the Church teach about artificial birth control and why? What is the difference between discipline and dogma, between small 't' tradition and big 'T' Tradition? Starbucks CEO Howard Schultz told the New York Times that he wants Starbucks to become a “third place” in people's lives. People have home, work and then a coffee house or bar as the three places that they focus most of their life's activities. I'd like to think that we humans can handle a bit more than three important places in our lives. Perhaps a life is like a stove with four burners. Two burners are in the front for top priorities, and two are in the back for important aspects of life that get less play day to day. I contend that for every believer, the Church should be on one of those burners. How can we be sure that God and the Church are priorities in our lives? Go to church on Sundays and feast days. Discuss the Gospel and the homily with family over coffee and donuts. Many Catholics are hit and miss on Sundays- let's start there. Don't shop on Sundays. Make the Sabbath day holy by going to Mass and then spending time with family at home, the park or somewhere besides the 'cathedral of conspicuous consumption.' This might seem impossible, but in most of Europe, shops close early Friday and don't open again until Monday. Everyone prepares ahead of time for the weekend. Listen to only classical or Christian music on Sundays. My parents insisted on this during my childhood. It really helps set the day apart from the rest of the week. Say grace before eating a meal- even in a restaurant! Educate yourself about God and the Church through the Bible and other books. Watch religious videos occasionally. Catholic school is not necessarily the best way to do this (sorry Mom and Dad- sometimes I think you wasted your hard earned money....but that's another post). Print an easy morning and evening prayer card, place it on your bedside table, and say a prayer when you go to sleep and wake up. Nightmares averted! Subscribe to a good Catholic magazine and buy The Catechism of the Catholic Church. Place both in the bathroom. Eventually, everyone will read these and learn! Go meatless every Friday. Why not? Many people are vegans every day of the year. It is such a beautiful reminder of Jesus' sacrifice. And there is something a little bit....gross...about eating meat when we are remembering Jesus' death on the cross. Get some holy water and use it. 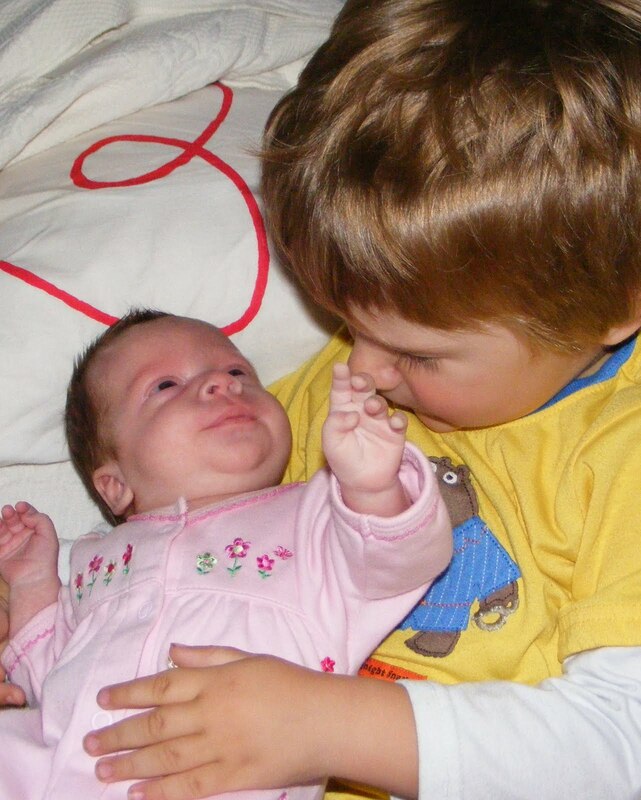 Sprinkle it on squabbling siblings if you are so inclined (thanks, Mom). Decide if you and your family are going to make God and church a priority. There is only so much time in the day. Church needs to be on one of the four burners to be a priority. --- What if the marriage is mixed? Hopefully, the kids can go to church with you. Then, come home and build a nice family atmosphere. Still refrain from shopping and try to have a sabbath. Have a popcorn and DVD afternoon together when you get back from church on Sunday. Ask your non-Catholic spouse to participate in some 'corporal works of mercy activities' with the family- mow the lawn of an older neighbor, collect food for the food bank, write letters to our servicemen overseas. The talents of your family will determine activities that will be interesting and meaningful to you. So- Clinton was right in saying that we make things a priority if it is important to us. It would be a shame if we know more about the latest celebrity scandal or sports stats instead of our Lord and Savior, Jesus Christ and His Catholic Church. An amazing book- talk about word pictures. I read Far from the Maddening Crowd this past summer when I was in the old country. All I could think is- Bathsheba is not Tess. I have read this masterpiece at least ten times. Although I love her mysteries, this is the book that she should be remembered for. This is science fiction for those that don't care for science fiction. If you really want to be scared, imagine a world where the plot of this book comes true. Her character development shows skill and love for her characters that most novelists just don't possess. Just please don't want the so-called movie. I cried in bitter disappoint. Another beautiful book. His writing is amazing, thought-provoking and emotional; if I had a book club, this would be the first on the list. First order of business would be to forbid everyone in the club to watch that horror of a movie that changed the end of the book which developed the theme of the book. I'll say no more, just read. I sense a pattern here- actress Julianne Moore has starred in two movies 'inspired' by my favorites which destroyed the book. I am not talking "Susan kisses Prince Caspian before she goes back home"-destroy, I am talking truly, madly, deeply destroying perfection. Tolkein converted Lewis to Christianity when he said something to the effect- "Some myths are true." 'Til We Have Faces is a myth of the pre-Christian world variety. The writing is stark and true. Read it after you have brushed up on your ancient stories courtesy of D'Aulaire's Greek Myths. While I should probably be reading Chesterton's Orthodoxy or St Augustine's City of God, I must confess that this book is the one on my bedside table right now. Much more than a child's novel, it develops the story of great things coming from the most insignificant of creatures, the simple hobbit being a mirror to humanity. Recently back in print, this novel takes the unloved orphan spinster suffers then triumphs idea and surprises the reader along the way. The character and setting descriptions are less indulgent than but just as rich as her Anne books. I just pray that a movie is never made of this favorite. 7. Irene Haas- The Maggie B. As a mom, I had to include a picture book. This is is one that I always reach for. I love the illustrations, the gentle rhythm of her writing and the unforced girl power-sibling love theme. Leave some of your much-loved favorites in the comments if you are so inclined. - Check your oven for Matchbox cars and wayward Playmobile figures. - Pre-heat your oven to 375 degrees. Melt a stick of butter in the microwave and pour it into a pan; this step is Mommy-only. - Mix a half cup of sugar, a cup of flour, and a cup of oatmeal along with a tablespoon of cinnamon and half teaspoons of cloves and nutmeg in a large bowl. This is the perfect step for a three-year old boy who is in dire need of a nap. Dump this dry mixture on top of the melted butter. When said boy isn't looking, attempt to even out the mixture. - Don't bother to peel the apples; this is semi-healthy apple crisp. Have big girls carefully cut dollar store apples into thin wedges, taking turns with the good knife. Ask question- Did these apples get washed? Check on baby and then make plans to get that little boy down for a nap. Big girls- work quickly so the apples don't brown. Throw apples into the pan on top of butter and dry mixture. - Sprinkle a little extra sugar and cinnamon on top and cover with foil so it doesn't dry out- another good step for a little one. - Place in toy-free oven and wait a little over thirty minutes until the kitchen smells yummy. In the meantime, put boy to sleep, do some laundry, get the girls back to some school work, check on baby and make a cup of tea. - Call the girls back into the kitchen to clean up a flour spill; then get them back to school work. - Check the spice jars for loose shaker lids to avert future disasters. - Run to the oven to take out crisp before it is too crispy. - Leave covered so that it will still be warm after dinner (bean soup and big girl-made garlic bread). Serve crisp with vanilla ice cream. Everyone knows that vanilla ice cream covers a multitude of sins. - Say a prayer and have a good appetite! 3. Celebrate the universality of the Church- In the magazine 'St Anthony Messenger,' there was a photo essay of a diversity Mass at a Western-rite cathedral. African tribal dancers, Mexican folklore singers and everyone in between were celebrated and represented as symbols of diversity within the Church. Visiting and understanding other rites also celebrate the differences and universality in the Church. 4. Understand what the Church means when we pray for unity- Let's pretend that the Orthodox Patriarch of Constantinople decided to place his church back under the authority of Rome (a girl can dream). Did you know that very little would change within his churches? In fact, his average lay person might only notice the addition of praying for the Pope during the Divine Liturgy (Mass). Could the average Western-rite Catholic accept and understand this? 5. Be an honored guest. We love visitors- especially semi-dedicated visitors. Perhaps you could supplement your liturgical life with a bonus Mass once a month at the closest Eastern-rite church? You might like their Bible study. Services like the 'Akathist' may be meaningful to participate in. 6. Make your kids smarter. An Eastern-rite church is a geography, history, and language lesson. ---Thanks for reading this far! Please remember, this is all one woman's opinion! Maybe you visited an Eastern church filled with ethnocentric agoraphobics who didn't make you feel welcome in their 'house.' If so, I am truly sorry and in my experience, that is aberrational. Also, I have focused on the Byzantine rite of the Catholic Church, but much of the same advice would go for visiting a Maronite, Coptic, or other Eastern church. My experience is from my rite, however, so we will have to wait for a Coptic priest's wife's blog (maybe it exists already) for specific advice on that rite. "If it feels good- do it." The bed is extra cozy Sunday mornings, so we stay in it. Like Falstaff, we "never eat fish on Fridays." Everybody's doing it, so I'll surf on over to those sites that would make my mother blush. Sure, I'll have one more drink- Didn't Chesterton advocate drinking and smoking (albeit only culturally-superior cigars)? So it follows; if it doesn't feel good, don't do it. Don't call your mother-in-law. Don't scrub that pot. Don't get up to make him breakfast. Don't bother with night prayers with the kids all squirmy and yawning. Anyways, we are in good company. Peter, James, and John didn't feel like praying with Jesus in Gethsemani, and the Church made them saints. In an Eastern Catholic community close by, they are mourning the loss of a beautiful family with 10+ children who have stopped participating in their church for a Western-rite church closer to their house. Nothing negative had happened to them at the Eastern church. In fact, all of the boys were faithful altar servers, and the father was a cantor. Mom and the girls also participated as choir and altar society members. The 20 minute drive was just too much; they didn't feel like struggling with their children to get them ready for a 9:30 Mass. While every person has the right to decide where they will go to Sunday Mass, the reason why they stopped going to their Eastern church will have serious consequences for the children. Getting up for school is a struggle, but they haven't stopped going to school. It seems that keeping the family tradition and participating in a church where "everybody knows your name" was of a lower priority. If we don't do good things because we don't feel like it, we are like animals who use instinct and not rationale to govern themselves. A feeling- either positive or negative- might be the beginning of a decision, but it can never be the reason for the decision. All moms remember the feeling of embracing their babies for the first time; what an intense feeling! Do we still feel that intensity when we are getting up to feed our six-month old for the third time in the night? No, but it is faith and rationale that helps us do our duty with love. Luke 6: 31-36, the Gospel for Byzantine Catholics last Sunday, is a clear mandate from Christ that we are to go the extra mile for our fellow man. And we are expected as Christ's followers to love our enemies and do good. Again and again, our faith is a faith of action; faith without works is dead. Feelings without faith and rationale are doomed to failure. Combining feelings, faith and rationale, we are higher than the angels! Amazing and wonderful- let's all try to be worthy of the gifts God has given us. 1. Are you really Catholic? YES! Thanks for asking! While the Byzantine Catholic Church looks very Orthodox, we are proud to have the Bishop and Pope of Rome as our supreme pontiff. Thousands of Eastern Catholic bishops, priests, monks, sisters and lay people were imprisoned, tortured, and killed through the ages (recently during Europe's stint with communism)- simply because they refused to renounce the Holy Father. Theologically and liturgically, they would have remained the same- just without the Pope. They laid down their lives to remain in the Catholic Church. Now in Central and Eastern Europe, the Church is dealing with the consequences of this. For example, most of the Eastern Catholic churches were confiscated by the state and given to the Orthodox church- the state church. 2. And your husband is a priest? Be careful what you wish for! I prayed to God for a good Catholic husband who would lead the family spiritually- that's what I got!But seriously, this question deserves a longer answer- maybe next Friday's Quick Takes on Conversion Diary. 3. What's with all the incense and the priest having his back to the people? 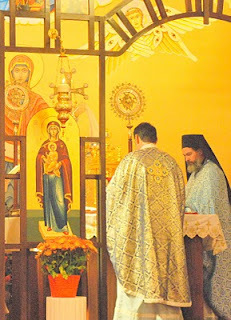 While it might look very traditionalist, this is just the way we have always done the Divine Liturgy(Mass). Incense and having the priest lead the people during the Byzantine Liturgy is the way we do it! Liturgical reforms or changes have been very few since St John Chyrsostom developed the Byzantine Liturgy in the early days of the Church. 4. Do you really abstain from meat every Wednesday and Friday and in Advent and Lent? For the Eastern-rite Catholic, both Advent and Lent are seen as penitential seasons.We try to take both fasting and feasting seriously! I know monks and nuns who are much stricter than these guidelines, however. 5. Why do the Eastern Catholic churches have so few believers? Even the largest, most successful Eastern Catholic church will have less believers than the local Western-rite parish. There are many reasons for this: in the U.S., Eastern Catholic immigrants were forced to become Western-rite if they wanted their children to attend the local parish school; others were lost to Evangelical or Orthodox churches that fulfill ethnic needs better; others simply don't have an Eastern-rite church close by. 6. So you can't say the rosary? Of course we can say the rosary! The difference is this, the rosary is a Western prayer- we also have prayers that honor Mary, the Mother of God. These prayers are more liturgy-like and a priest leads them. So for a private devotion, the rosary is perfect! Eastern Catholics don't want to lose their traditions, however. 7. So the Pope is really, really your boss?